The Bodygraph (Rave Chart) is the visual essence of the Human Design System. It combines all of the HD information in a graphic synthesis, which can be grasped intuitively. 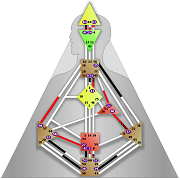 The Rave Chart is a clear and simple depiction of the human structure. Everything in the graphic is related to the human body. 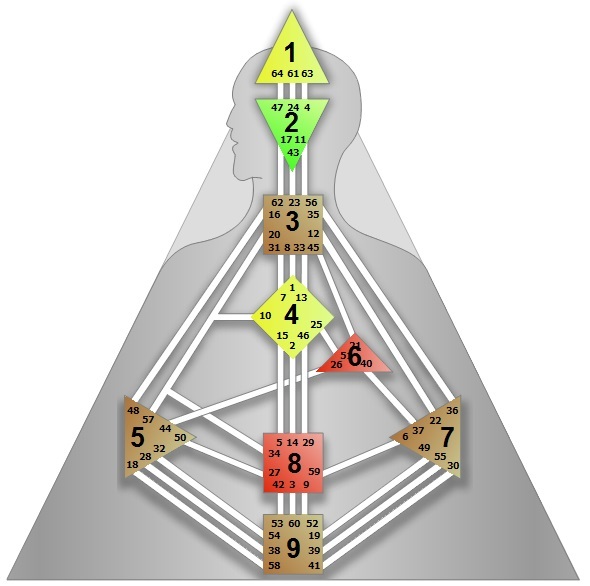 It is like a wiring diagram that shows the connected information and gives us deep insights into our inner functioning. The 9 Centres are connected by 64 Gates, the 2 gates which connect 2 centres together form a Channel. 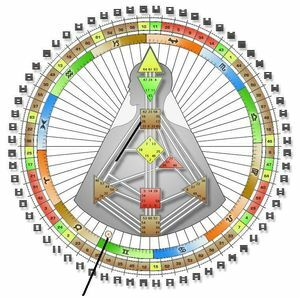 The Databank – the astrological information is translated into the Hexagrams and Lines of the I’Ching and is then copied into the according Gates of the Bodygraph. e.g. Sun in 3°30’ Gemini – corresponds to Hexagram 20, 4th Line. At the Design-time the development of child’s body in the womb has reached a stage when it can take in its ‘soul’, its awareness. To put it figuratively: the biogenetic ‘vehicle’ takes in the ‘passenger’, the awareness of the personality. 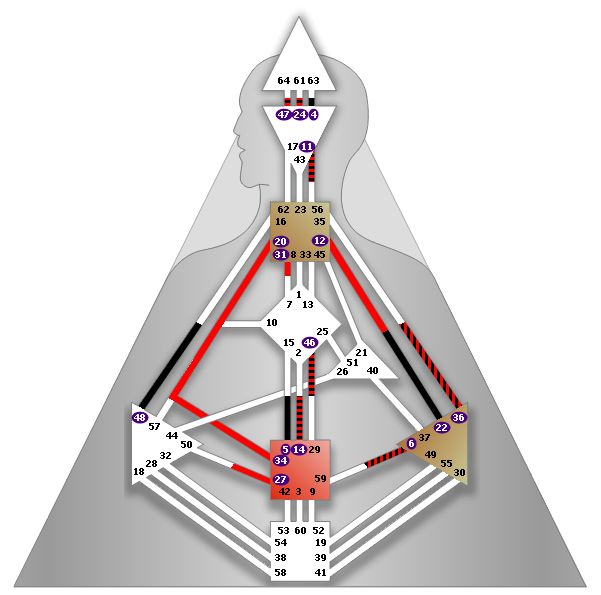 The Personality-data represents the conscious and is shown in black, the Design-data represents the unconscious and is shown in red. 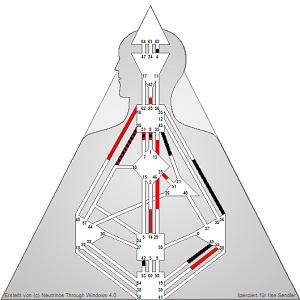 The Centres of the Human Design System© are based on the ancient Indian ‘chakra-system’. In HDS every centre is associated with a specific function, which can either be fixed or open in the ‘construction plan’. The definition and connection of centres also shows the four basic ‘types’ of human beings. This area represents stress and adrenalin. It is one of the four body’s motors. Here you can either read the (kind of) openness for stress or which basic existential forces are driving this specific being. This area represents physical strength and sexuality. It is one of the four body’s motors. Here you can read if and how consistent energy is available for this being. It is activated for about 70% of humanity and creates the type of ‘Generator’. This area represents emotions and feelings. It is one of the four body’s motors. Here you can read if and how somebody is open for and takes in emotions of others, or what kinds of emotions are consistent for them. This area represents willpower. It is one of the four body’s motors. Here you can read if and how consistent willpower is available for this being. This area represents instinctive and intuitive awareness. 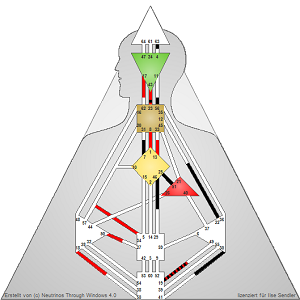 Here you can read if and how consistent and reliable spontaneous intuition is available for this specific being, and also the general functioning of the immune system. This area represents identity, direction and love. Here you can read if and how somebody is open for various directions in life, or if they are fixed to certain topics of direction and love. This area represents language, manifestation and action. Here you can read if and how somebody can speak and/or act. The numerous possibility of connections to other centres are especially important and are related to ‘Type’. This area represents intellectual awareness and the mind. Here you can read if and how somebody is open for intellectual information, or if they think in a consistent and reliable way. This area represents mental stimulation and inspiration. Here you can read if and how somebody is open for (outside) mental stimulation or if they process stimulation in a fixed and reliable way. 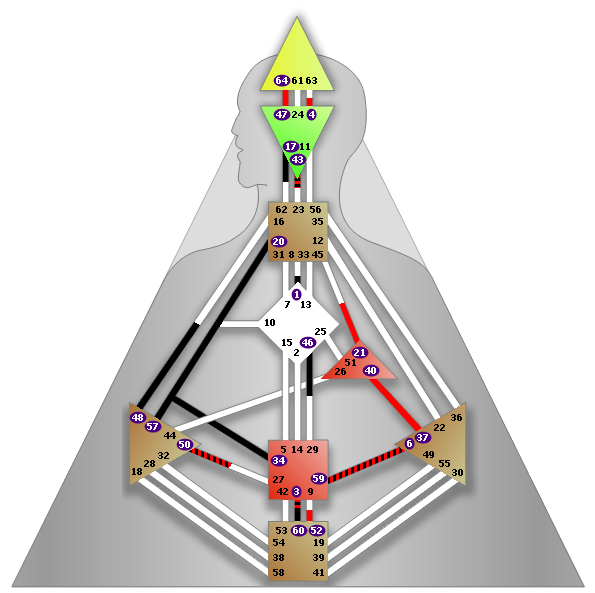 If the astrological information leads to the activation of a whole channel (2 Gates opposite each other) both associated centres will be coloured in. This is called ‘Definition’. What is reliable within us, what we can work with. Any defined channel is activated permanently. This is where we are fixed and unique, unmistakably ourselves. Some of this will be conscious, some will be unconscious. What is not fixed within us, where we are open, where we can learn and adapt. This is where we can be influenced and conditioned. Open centres show us what kind of ‘courses’ we have to book in the ‘school of life’. Here too some will be conscious and some will be unconscious. 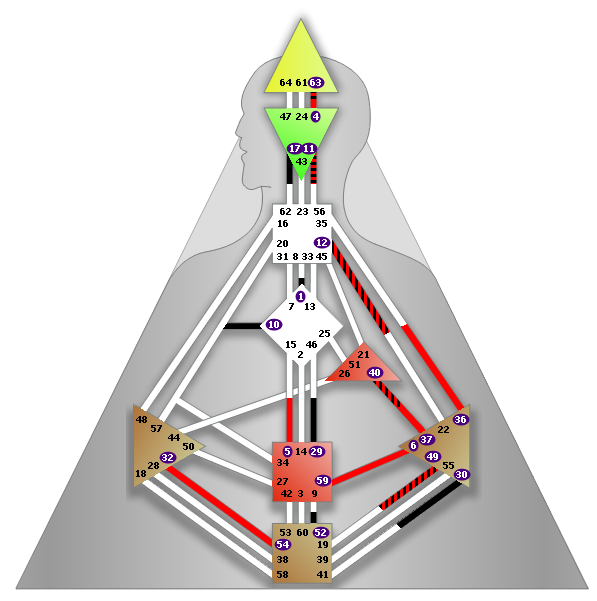 to identify the individual structure of any given human being in a graphic and easily graspable way. to identify what is bonding and/or separating two people. 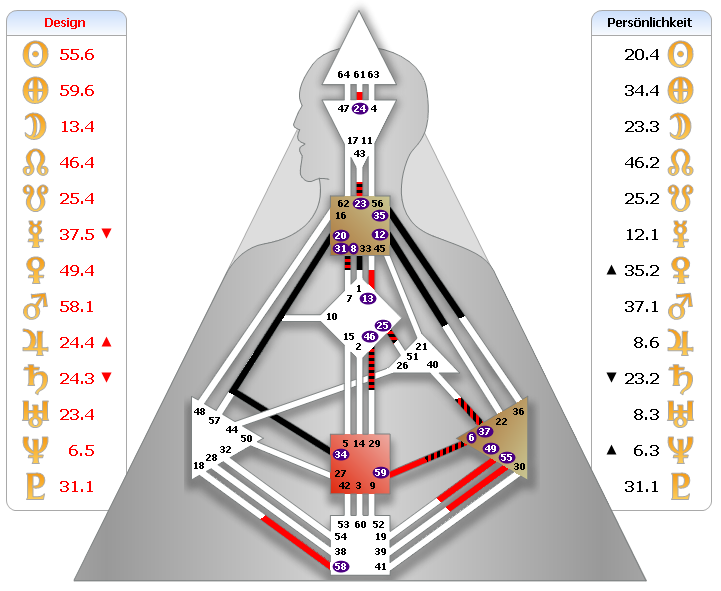 about 1% of human beings – the so called Reflectors – have no activated areas in their chart. three activated areas are not connected to each other. 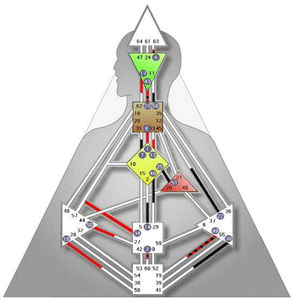 four activated areas are not connected to each other. In spite of the huge individual diversity mankind can be divided into 4 basic Types. Type and the according Strategy show the fundamental behaviour and how to interact with others. There is clear statistical proof of the existence of Type and it is the starting point of any HD analysis. Through strategy any type can learn their correct behaviour and how to minimize (inner and outer) resistance. 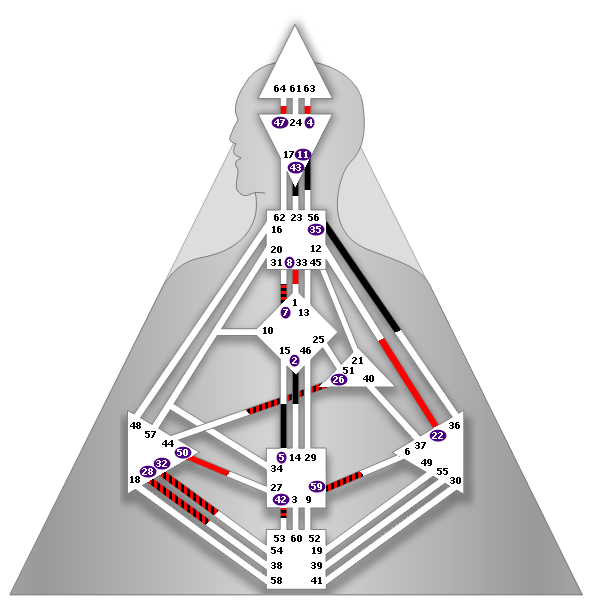 One or more of 3 motor centres (ego, root, emotion) are connected to the throat centre, the sacral centre is open. About 8% of the population are Manifestors. They are a minority and they are here not to be restricted. They are pure energy people and doers, here to act. But their acting very often meets resistance, especially manifestor children are punished for it. To lower or avoid resistance (and the corresponding anger) manifestors should inform others before they act. About 70% of the population are Generators. About half are ‘pure Generators’, the other half are ‘manifesting Generators’ (at least on motor is connected to the Throat). If Generators try to act like Manifestors they meet a lot of resistance and their life is full of frustration. Generators should wait for things to come towards them, so that they can respond and react. Their strategy means: don’t be initiative, stop running after things, just wait and respond to what turns up. 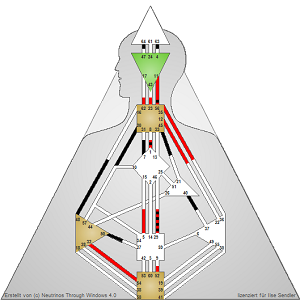 The sacral centre is open, the throat centre is not connected to a motor. About 21% of the population are Projectors. Their gift is to know how to handle energy, they are here to work with the energy of both Generator and Manifestor, to guide and lead them. The Projector functions best if they are recognized for what they are. The strategy is: wait for recognition and invitation – invitation to love, job, marriage… They are not here to be initiative but to wait until they feel welcome and are invited. Only about 1% of the population are Reflectors, they are the rarest Type. 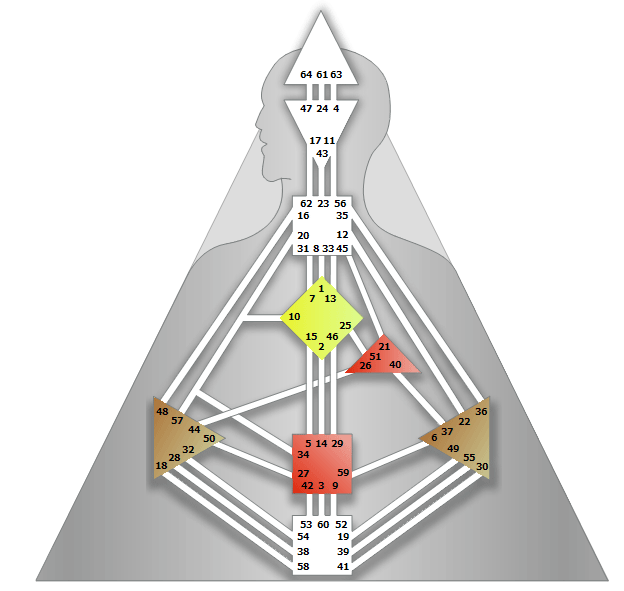 They are very open, there are no activated (coloured) centres in their charts and therefore they take in others very deeply. If a Reflector understands their nature they can become very wise, but often they experience life as a big disappointment. The key for a Reflector is the moon. A Reflector should wait a full moon’s cycle (28 days) before arriving at any big decision. The 12 different profiles show the basic way of how people live their lives. Exact information of course is always based on the interplay of all the different details within a chart. The conscious side (1) shows the investigator who is trying to get to the bottom of things and – in the end become an authority with their solid foundation. The unconscious side (3) shows an anarchistic being. As soon as they regard the foundation faulty they are ready to eliminate it and make room for a new one. A solid base and secure foundations on all levels are very important here. The conscious side shows – just like in the 1/3 – the theme of investing the foundation to become an authority over time. The unconscious 4 notices that there are other people ‘out there’. Their theme is to externalize something and look after friendship and networks, always waiting for the right moment and opportunity. The ‘investigating opportunist’ is waiting for the right timing and friends to externalize their foundation. The conscious side shows a withdrawn ‘natural’ who is busy with their own stuff whereas others project on them what they think might be good for them. The unconscious side shows again a friendly opportunist who waits for the right moment. This profile needs to be called out. Education and support are important and the phase of dependency and care may last longer. The conscious side again shows a hermit like in the 2/4. ‘Leave me alone’ and ‘why are they all bothering me?’ are general themes. The unconscious 5th line represents the potential for practical and general solutions. The 5 carries like the 2 the theme of projection. Projections from the outside may lead to paranoia in this withdrawn personality and therefore ‘distance’ is a very important aspect here. The conscious side shows the anarchist and martyr. They stumble into situations and relationships to find out what does not work. Learning from mistakes and a lot of variety is very important. The unconscious side speaks about universalizing things. The heretic who questions standards and rules and the general who is expected to find solutions in time of crisis. With this profile it is vital to realize that mistakes are part of any development. This is one of the (four) profiles that mark a life of 3 phases – 0-about 30, 30-50, after 50. Here until about 30 years of age both the conscious and the unconscious side are dominated by the theme of trial and error. Chaos, mistakes, pessimism and broken relationships belong into this first phase of life. It is especially important not to be punished for ‘mistakes’ as they are a vital ingredient of the learning process. After about 30 years of age the viewpoint changes, these being turn into observers, administrators and authorities. Objectivity grows out of 30 years of experience and stamina. The real challenge begins after about 50 years of age. Beings with a 6th line profile are meant to become the living example and discover what ‘soul mate’ is all about. The conscious side shows again the opportunist, who is fixed and very busy looking for friendship and the possibility to externalize their truths to the world. The unconscious side goes through the 3 phases mentioned above. 30 years of chaos, 20 years of aloofness and in the end becoming a role model. For profile 3/6 and 4/6 this is an unconscious process, unaware to the conscious side of the personality. This profile is the bridge between personal destiny and transpersonal karma. The conscious side shows again the opportunist who waits until out of friendship comes a good opportunity. The unconscious side demands a solid foundation. The base must be correct to be externalized without a change, friendly and fixed, without chaos or adaption. A sound education is especially important for such beings because the foundation is meant to last a lifetime and therefore has to be very stable. The 5th line has to reach out and be a part of relationships and connections and universalize their truths. The result of other people’s projection is a good reputation which only lasts if the 5/1 truth is practical and applicable. The unconscious side is pointing at foundation work again. The base has to be correct so that the expectations may be fulfilled. Too much pressure and expectations at an early age can lead to paranoia. Like in 2/5 we see a double projection field. Here the expectation on the conscious side is that these beings are a saviour, the projection on the unconscious side leads to everybody thinking that they know what might be good for them. Distance is very important but makes them even more attractive. It is difficult to involve these beings into anything because they can only motivate themselves. The potential power and perfection needs preparation and education. 5/2 children need peace and distance to avoid the building up of paranoia. Again we see an indication of the 3 life phases, this time on the conscious side. Until the age of about 30 trial and error is a main theme here. But the true theme is to be a role model, something that is expected of them right from the start. The unconscious side has to deal with expectations therefore the possibility of retreat is very important but can only be accomplished in the second phase, after the age of 30. Then these beings can become the objective observer and gain influence in society. After the 50th birthday the 6/2 has to get involved again with the world, give up the observing and become a living example. This profile too lives through 3 phases in life, in the first phase the trial and error is represented on both the conscious and the unconscious side. 3/6 children need extra support to go through the chaos but at the same time have to be able to experience many things without outside interference or expectations. It is very important that they learn to see the positive side of any mistake and not get punished for it. In the second phase their aloof time of objectivity is not undisturbed, because the unconscious 3rd line keeps on trying things out. The third phase marks a time of being a role model. Although the retreat was rather turbulent and the distance could not be kept up for a long time but the collected experience is now valid and large. Inner Authority is the place within us from which we can arrive at authentic decisions. This leads us deep into the Human Design System and we cannot elaborate on it here. One very important notice: if the ‘Solarplex center is your inner authority you should wait before deciding anything. To sleep over it at least once should be the minimum! In Human Design the four Types each have a specific strategy how to live and decide as themselves. 1) The Generator Strategy is to respond. Wait until you are asked in whatever way and feel a reaction within you. 2) The Projector Strategy is to wait for invitation. You can only use your energy correctly after you have been recognized and (formally) invited. 3) The Manifestor Strategy is to inform. Inform your environment before you act and this way create allies instead of people who distrust you. 4) The Reflector Strategy is to wait about 1 month. Only over time and with a lot of ’reflection’ (and in exchange with others) can you become clear about any decision. 1) The Not-Self theme of the Generator is frustration. If you do not wait for your response you will meet resistance and end up frustrated. 2) The Not-Self theme of the Projector is bitterness. If you do not wait to be seen (recognized) and invited you will meet resistance and become bitter. 3) The Not-Self theme of the Manifestor is anger. If you do not inform before acting you will meet resistance and become angry. 4) The Not-Self theme of the Reflector is disappointment. If you do not take your time you will meet resistance and become disappointed. the second date (in red) on your chart is used for working out the unconscious, physical part of your personality and represents in many ways the ‘missing link’ for recognizing the whole picture. The conscious and unconscious sun/earth axis together form a ‘cross’ in the wheel of the zodiac. It represents a basic ‘headline’ for any life with a profound and nearly unlimited depth. The interplay of all aspects of a rave chart results in an amazingly exact picture of any personality, where the purpose and personal meaning of life can be seen and read very clearly.